I must admit, I used to be a maxi dress/skirt hater. I was serving up Haterade left and right to that poor style. It was unwarranted and I would like to offer my sincere apologies to the Maxi. 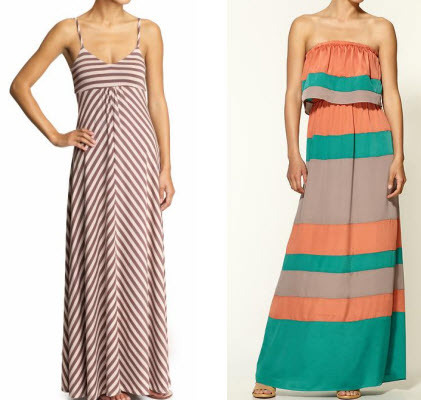 I really think the early styles of the maxi dresses that emerged in 2009-ish were more moo-moo than hot-mama. So that, in turn, may be why I had an aversion to the maxi. But oh how the tides have changed. 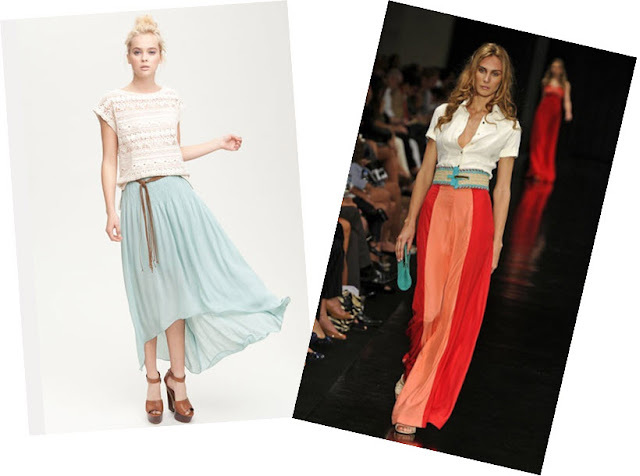 Suddenly, I'm adoring lengthy skirts and feel the urge to purchase oodles of them for summer. I've also noticed that certain styles and prints of the maxi can be uber-flattering on practically any body shape. Here are a few of my current favs that I've seen whilst' online shopping browsing. 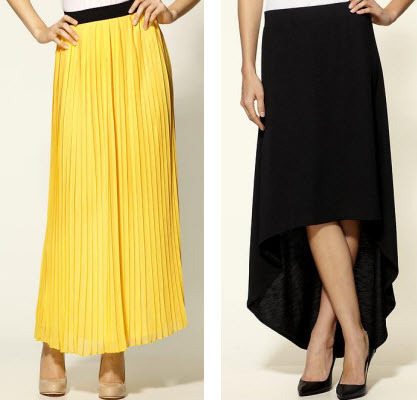 I'm all about the maxi skirt/dress now. Apparently, I've had a maxi-piphany. Will you sport a maxi style this summer? I am so with you! I was anti-maxi for a very long time, but have recently come to my senses. Something about long, flowy skirts with fitted tops just feels like summer and I'm ready! I'm still not on the Maxi dress bandwagon....looks nice on some people to me, but not for me. Love them, but not sure how to make it work appropriate for a law office? Suggestions? i'm OBSESSED with maxi's. always have always will be. they are SO comfortable no matter what and fashionable. I'm obsessed with Maxis and I side-eyed them at first too. I wear them allllll summer now. LOVE THEM. I couldn't agree more! I was also a hater and find that I love them more and more as the days grow longer!! I love it now with a cute tank or fitted tee- even through in a summer scarf for the cooler spring days! Oohh, I wasn't a fan of maxi dresses/skirts at first either. But I've pretty much been dying to get one. SAME with me! I thought I was never going to like this trend but like you, I cant wait to wear this. I actually bought a chiffon peach maxi from f21 back in october and have YET to wear it - I am just confused about shoes - no idea which ones to wear! lol! Same here! I was a hater since the beginning, then a lightbulb went off a few weeks ago and I jumped all over the maxi bandwagon! I'm going to be traveling around Europe this summer, and I think they will be the perfect way to look cute and be comfortable at the same time. I found a maxi that was color blocked in three tall stripes from top to bottom in the maternity section at Target. I'm pregnant, I promise. I don't just shop there! I wish I'd have bought it. It was so pretty! I wonder how Maxi dresses got their name? How does anything?! I think they are cute. They look stylish and comfy and they have more shape to them now. I need to put it on my wardrobe list for Spring/Summer. Yes, I keep a running list!! i have two maxi dresses i bought on a whim and i haven't had the guts to wear them yet. but i think it's gonna have to happen very very soon. they look so stinkin comfy, my kind of stlyle. 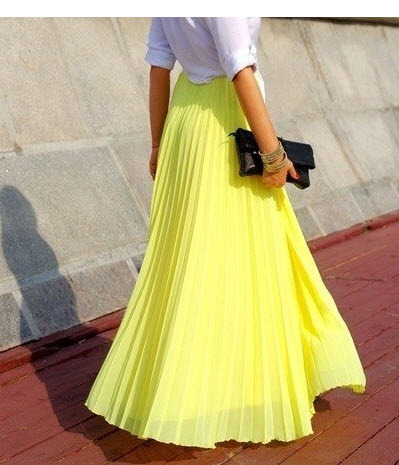 That yellow skirt is amazing! I always do feel a tiny bit hippie in super long skirts and dresses. But its such a floaty swishy feminine feeling. I love it! That Ark & Co. colorblock one is gorgeous. I'm right there with you - I used to hate these things...and now I've got two of them. I love them! I'm a prior maxi hater, too. I just recently gave in and jumped on the bandwagon for this summer! I love that Ella Moss one! I just bought a hot pink maxi skirt and I'm loving it...but too chicken to wear it just yet! I'll have to let you know how it goes if I ever decide to wear it out...maybe for my birthday outfit this weekend?! Happy Wednesday, pretty girl. Love you. YES def! already have a few! you just need to find the right one for you! i did a post on it last week! I hate to admit it but I was sort of the same way. Yikes. Eat my words. I LOVE them now. I'm slooooowly converting to becoming a maxi fan. I wore an Alice+Olivia dress (that my mama talked me into) for our engagement photos, so now I have positive connotations! I'd love it if you'd do another maxi post in the future. These are fab!